There is no other better place like home. It is therefore very important to ensure that you have furnished your house with the right interior décor products after building. This is because the decoration done must always compliment the whole house. It is easy to transform literally any space in your house into a place of warmth and comfort. Wondering what you can do to transform the look of your house? 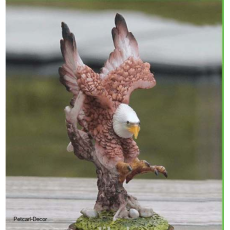 An eagle resin statue is all what you need to transform any empty space in your house. The eagle statues come in different colors, and sizes making it easy for you to choose what suits your preference. They decorate and as well add a color of beauty in any room in your house. It has not been easy for many people to get a shop where they can buy quality and affordable statues. If you are looking for such a shop, then you can visit Petcarl Décor shop to buy unique and hot eagle statues. Try us today!